As a registered dietitian, I love hosting healthy dinner parties. 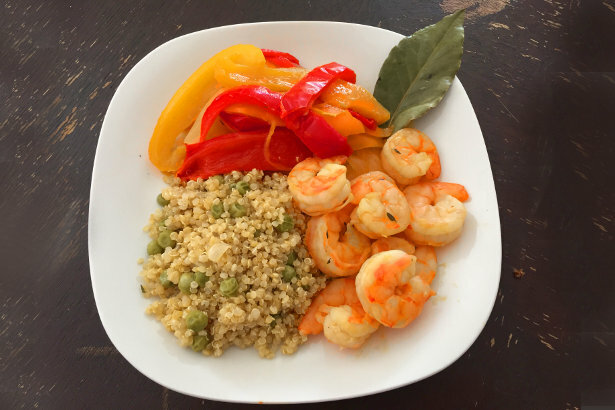 One of my favorite ingredients is shrimp, because it’s a lean protein and good source of vitamin D. However, it can be tricky to cook a large batch of shrimp just in time for your guests without overcooking it. The beauty of using a crock pot is that you can allow your dish to finish cooking while you greet your guests. The bell peppers in this dish provide more than aesthetic appeal as a good source of potassium and the antioxidants beta-carotene and capsaicin. Quinoa is an excellent plant-based source of protein that provides all the essential amino acids as well as plenty of fiber. Unlike other starchy vegetables, peas also provide protein and fiber which are nutrients beneficial for satiety and blood glucose control. Serve this colorful dish that requires little active preparation time and be assured that your guests will receive a delicious meal with a host of nutritional benefits. 1. Bring vegetable broth and wine to a boil. Add quinoa and peas, reduce to a simmer, and cover. Cook 25-35 minutes, stirring often. Quinoa is done when it “pops” and looks like it has formed tails. 2. Sauté garlic, peppers, and onions with vegetable broth until slightly softened. Transfer to crock pot, add herbs, wine, and shrimp. Cook 30 minutes on low setting or until shrimp are pink and curled. Squeeze with fresh lemon juice and serve.